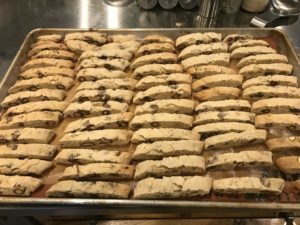 This biscotti (in Italian, say BEES-KOTEE) are so delicious that I make them in double batches, to make it worth the work, as they disappear so rapidly! They also make wonderful gifts, packed 6 or so in a qt. sized zip-lock bag. 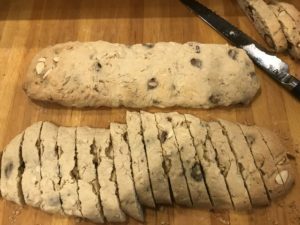 I will list the ingredients for a regular batch, however, and you can just double the ingredients, if you would like to make them as shown, using in your case two regular baking sheets. Blend together in a medium bowl: flour, baking powder, cinnamon, salt and set aside. In a mixer bowl blend softened butter. Add sugar and beat until fluffy for at least 3 minutes. Then add eggs, amaretto, almond extract, vanilla and blend well. 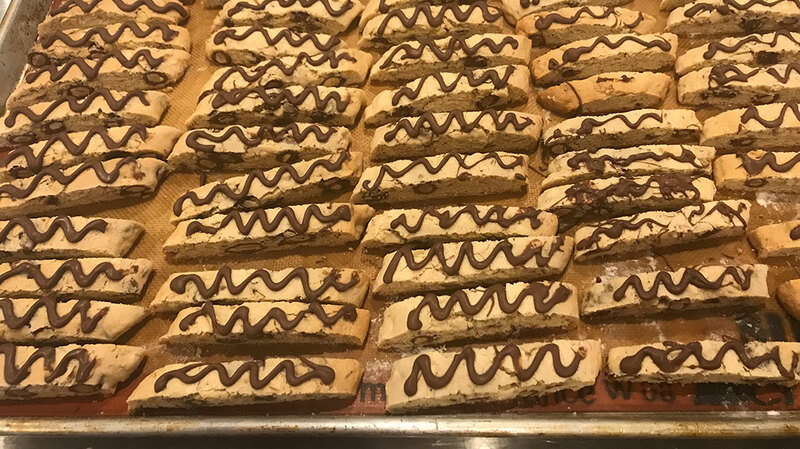 Fold in raw almonds and chocolate covered almonds. 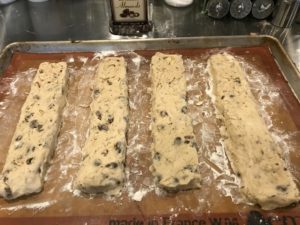 With some extra flour on your board and on your hands, remove dough onto board, and divide in half. Place dough on baking pan and shape each half into logs, about 3 inches across and about 14 inches long. 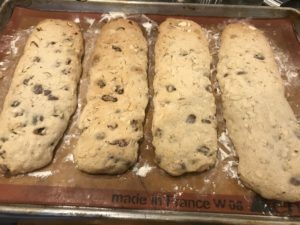 Allow space for some expansion during baking Place pan on middle shelf of preheated oven and bake 30 minutes, or just until logs are set and beginning to brown on edges. Remove from oven, let cool about twenty minutes. Turn oven down to 250 degrees. With a serrated knife, cut logs diagonally into one-inch slices and place back on baking sheet, top-side up, with a little space between. Place pan of slices back into oven and set timer for 30 minutes. Check slices to make sure that they have hardened and don’t give to the touch. If needed, place back in oven, turn it off or very low, and leave them to finish hardening. When cooled, squiggle melted chocolate along tops of slices. Add 2 large squares of chocolate bark to a quart sized ziploc bag. Place bag of chocolate bark in microwave for one minute. Press chocolate a bit, then melt 30 seconds more until it is completely melted. Remove from oven, snip tiny end of one corner of bag, and squeeze icing onto slices.